The add-on allows to display a thumbnail of a product on the order details page and the invoice and create attachments to the orders. Now it will be very easy to find necessary files and difficult to lose, as all the data will be attached to corresponding orders. We have developed a small, yet very useful add-on which improves your customer’s experience by adding some features to the order details page and invoice. With the Order Improvements add-on, you will be able to attach files to the orders which were created by the admins and show the product image in the Product Information block. Let us show you the screenshots to demonstrate how it works. The add-on has just one setting to define the size of the product image. 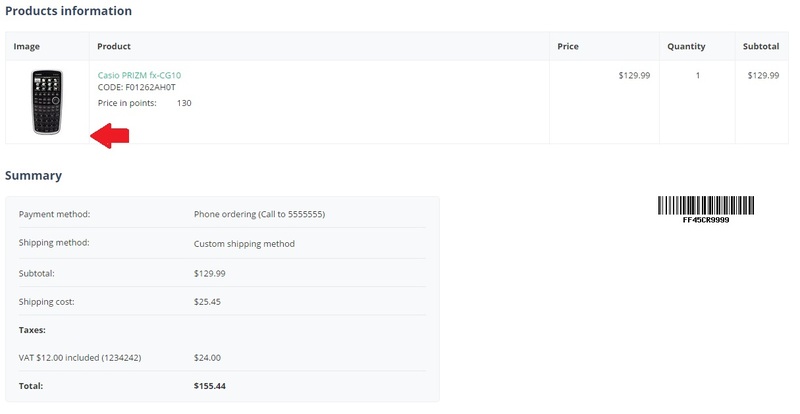 You can set the appropriate height and width of the icon on the order page and the invoice. Need to add attachments to orders while or after processing them? Too often, there are some documents associated with orders, and it would be great to keep them in one place. The Order Improvements add-on enables you to attach important data (like manuals, warranty details, logos, etc.) to any orders after customers or admins have created them. 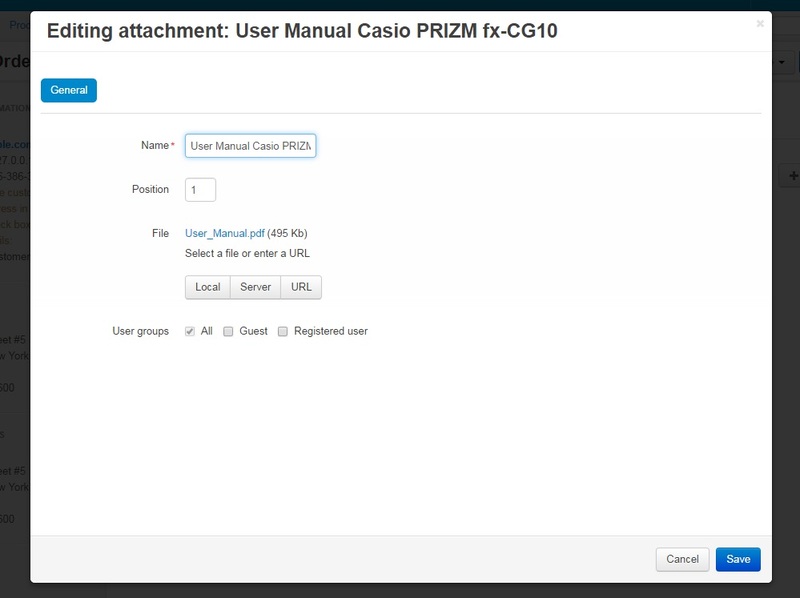 In the add-on settings, you can easily change the position of the attachment in the list and choose the type of the User group who will see the file. The customer will see the file in the Attachments tab on the Order information page. Thus, this powerful and very easy to use tool will make your order handling a lot more effective and organized. 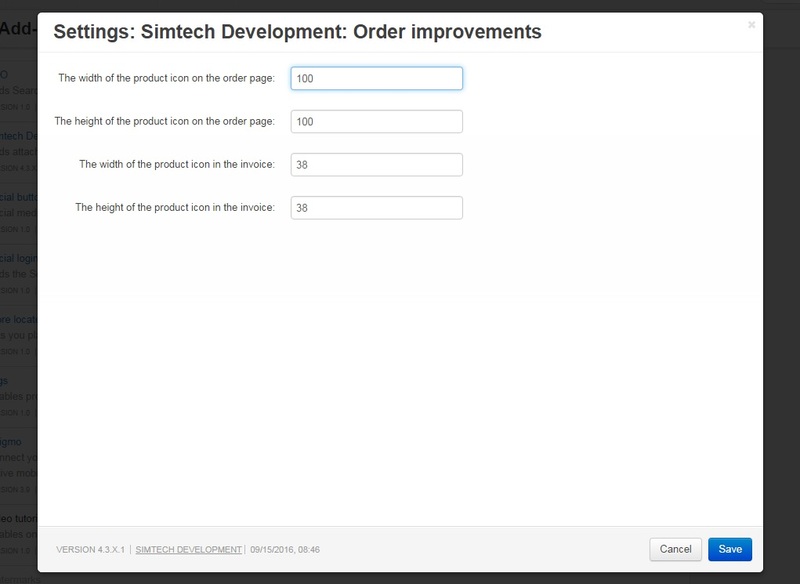 If you do not have the Order Improvements add-on, your customer will see the order details page without an image in the Product information block. Looks unattractive, right? Hope you agree that it’s quite another thing and the image makes the page more informative to customers. The add-on is compatible with CS-Cart and Multi-Vendor 4.3.5 and above. Модуль просто отличный. Спасибо Simtech и Яне за помощь в настройке, обратную связь и реализацию многих полезных и удобных фишек. This addon has evolved over the weeks to almost becomea customer quotation system in it own right. YOu can add any file to the orders created and have them either emails to a customer with the order emial or you can "send and invite to buy" with the files/images/or digital sample for people to buy. I have customised the language variable on the email with html and works a treat. I would recommend this addon. Seems like you have the old version of the add-on. We have fixed the issue. You can find the new version in your File area. Please download the new archive. [+] The output of the attachments number has been added to the tabs. [!] The attachments were not added to the order in the admin panel on mobile devices. Fixed. [!] The PHP error was shown in my orders section. Fixed. [!] A php notice appeared when deleting the order in the canceled status. Fixed. [!] The add-on was not compatible with product variations functionality in CS-Cart version 4.7.2. Fixed. [!] Prices with applied promotions were displayed incorrectly in the order details. Fixed. [-] Image re-generation was included. [!] Image size couldn't be changed in the orders. Fixed. [!] The product images were shown with disabled setting “Show product images on the order details page in the frontend”. Fixed. [!] Not all the products bought through the Buy Together add-on were shown on the order detail page in the admin panel. Fixed. [+] The 'Send notification to the customer about upload of the file' setting was created. [+] The Hide images setting was included. [+] Pdf extension was added to the files. [~] The 'Send attachments by e-mail' language variable was changed. [!] E-mails were not sent to the customer when the order was changed and the add-on was active in CS-Cart 4.3.1 - 4.3.4. Fixed. [~] Add-on's icon was changed. [~] Product's picture was center aligned. [!] Incorrect files size calculation. Fixed. [!] Images in the letter were shown lower than the description. Fixed. [+] Possibility to choose for which customers email attachments will be available was added. [+] Send attachments by e-mail checkbox was added. [!] The add-on was displaying default image for the product instead of the image with option variants. Fixed. [!] When files were attached in the attachments tab, the Communication field size reduced. Fixed. [+] Now the admin can attach files to the e-mail sent to the customers when the order status is changed. [+] A privilege for the administrator to create links manually was added. [+] Product images were added to the Product details page and Invoices. [~] The add-on was adapted for CS-Cart 4.2.4.